Students, however, never seem to have pencils. Students from around the state of Delaware were challenged to solve this vexing elementary school issue as part of the Meaningful Economics and Entrepreneurship Competition (ME*), a multi-day event hosted by the Center for Economic Education and Entrepreneurship (CEEE), an experiential learning center in the University of Delaware’s Alfred Lerner College of Business and Economics. For 31 years, ME* has provided an opportunity for third-, fourth- and fifth-graders to apply classroom economics lessons and develop fundamental business skills like innovation, problem-solving and teamwork. Approximately 350 students participated in this year’s event, produced in partnership with the Delaware Financial Literacy Institute. Bank of America and Discover provided funding for this year’s competition, including materials and t-shirts for each student. “Without our sponsors, we would not be able to offer this program,” said Bonnie Meszaros, assistant professor of economics and associate director of the CEEE, in her opening remarks. 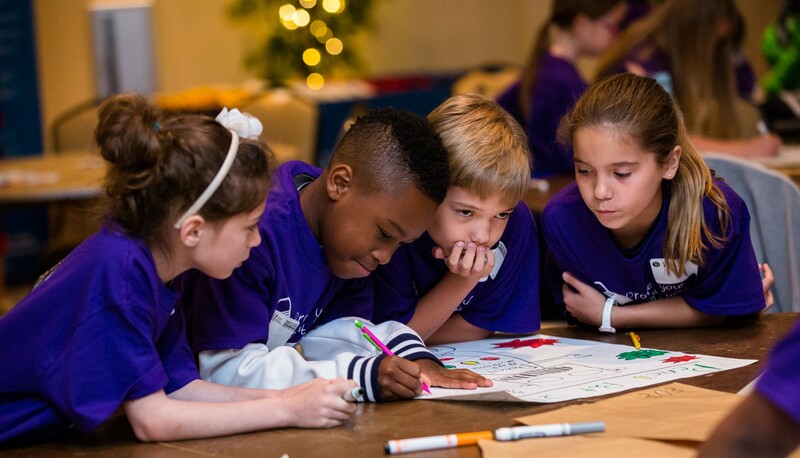 On the first of the competition’s four days, third-graders from elementary schools across New Castle County worked in four-person teams to brainstorm innovative solutions to the vanishing pencil problem by designing a product and creating an advertisement for presentation to a panel of volunteer judges. Products ran the gamut from state-of-the-art technology, like the GPS-enabled Find-O-Matic, to simpler solutions like a tacky coating that sticks to any surface. In addition to the problem-solving activity, students were presented with two more challenges: a time-limited production activity and a written exam. Teams were judged on each component, and ribbons were awarded to the top four teams in each event. Volunteers from Adopt-A-Family Delaware, Discover and Capital One were on hand to judge each segment of the first day of competition. Employees from Barclays, Fulton Bank and Wells Fargo volunteered for subsequent competitions in Newark and Georgetown. The competition opened with a production activity that tasked students with producing bookmarks for distribution to clients of Adopt-A-Family Delaware, a local charity supporting disadvantaged Delaware families. Teams scrambled to complete a set of 10 bookmarks from a kit of materials in just 30 minutes while carefully following instructions on assembly and design. Once completed, the bookmarks were scored on a rubric for proper construction and presentation. In a tight competition — 11 schools scored within a four-point range — first-place honors were shared by teams from Elbert-Palmer Elementary and Gallaher Elementary. The completed bookmarks will be included with backpacks to be distributed to underprivileged children this fall as part of Adopt-A-Student, an initiative created by Adopt-A-Family to provide free school supplies for approximately 1,500 families statewide. Recipients will write notes of thanks on the back of the bookmarks, which will then be mailed to the program’s donors. In the second piece of the competition, teams were tested on concepts in economics, finance and entrepreneurship. 15 schools took home ribbons for their performance, led by a three-way tie for first place between MOT Charter School, Thurgood Marshall Elementary and West Park Place Elementary. The event concluded with an opportunity for students to show off their entrepreneurial and problem-solving skills. Teams were presented with the problem of disappearing pencils, and were challenged to create a good or service designed to keep pencils in students’ hands or backpacks. A mere invention, however, would not be enough to satisfy the judges. Students also had to give the product a memorable name, define a target audience and price point, develop distribution channels, and finally, create an advertisement to showcase their wares. Sharon Brown, a volunteer from Adopt-A-Family who helped judge the entrepreneurship competition, was impressed by the creativity on display. “It’s hard to believe they’re third-graders,” she said, marveling at the students’ use of sophisticated technology solutions, multiple sales channels and marketing through websites and TV ads. MOT Charter took home a fourth-place ribbon for their Pencil Generator, a gadget designed to produce pencils on demand. Third place was awarded to Downes Elementary for their GP Pencil, a bracelet paired with a pencil-grip tracker to locate missing pencils. Wilson Elementary won second place for their Beep-A-Pencil, an electronic locating system advertised with a catchy jingle. A second MOT Charter team claimed first place with their Walking Pencil – a writing implement that simply walks back to its owner when dropped. “I thought all the teams were terrific,” said Robert Glen, Bank Commissioner for the State of Delaware, who served as a volunteer judge for the problem-solving challenge. Glen was particularly impressed with the level of commitment he observed from each student. “It’s great when all the team members are involved and participating,” he said, noting that many teams excitedly promoted their products with a variety of entertaining skits, jingles and songs.